Have you ever just wanted to sew all day, forget the cooking and all the things you need to do in the house. Buy all the threads and just get sewing, quilting, binding, machine embroidery, stitch illustration or whatever you want to do for the day? I love my new box from Aurifil Threads called, "Sew Fun! Collection", Love the bright colored threads that I use with fabrics, sew illustrations and Machine Embroidery. Why not! You deserve to do just that. Sometimes we just need that creative outlet, it's called Self Care! I recommend choosing a hobby or two to help increase your creativity, increase your stamina for life, and to just have FUN! Somedays my studio gets mounded with paper, fabric everywhere, or I have Binding Babies® all over getting ready to be painted, or packaged and sent to you! My studio isn't always perfect, and not in order all the time. Some weekends I just close the doors and do something else. We all struggle with everyday life and I am giving you permission to choose something today that will make you happy, laugh and enjoy the process! If you have never quilted, or done any sewing. Explore it and have fun! Remember it doesn't have to be perfect. Trust me my first few quilts were not perfect, but it never stopped me from trying and enjoying the process. 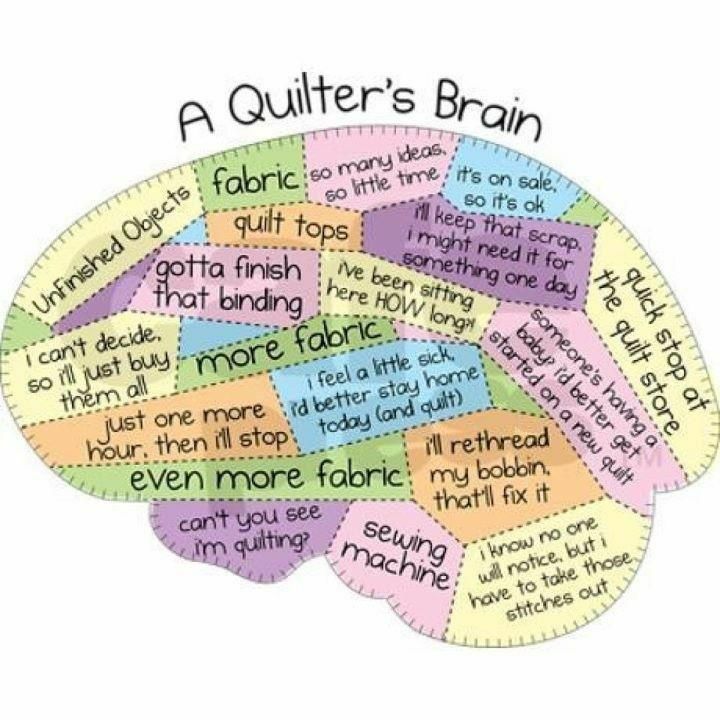 I love this quilters brain image off of Pinterest. I feel like this can represent any hobby really. It represents something that you can get excited about! Something that will make you fall in love with creating again. Find the joy, humor, and love in something you love to do. I give you permission! What hobby will you choose? You can choose more than one, as long as you embrace your Creative Journey. I am so excited to be apart of the We All Sew team. It's been fun being a BERNINA Ambassador and to help bring inspiration through heartfelt creative projects. When my friend asked if I would design a quilt block for her that she could frame for her Father and Siblings, I had to say YES! Sharing what I chose for my one little word for 2019! What word did you choose? We want to make 2019 a year with intention and growth. Happy Holidays! We are glad to be back and help create special gifts for your Holiday Shopping! We are always looking for ways to improve and we are excited to share with you our new product that is made right here in the USA!